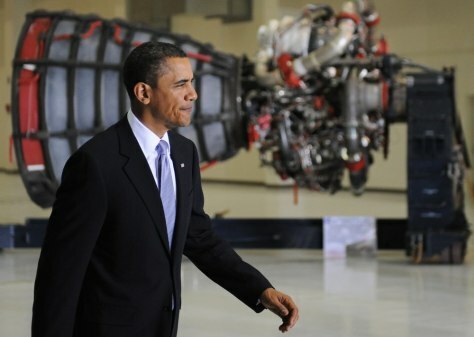 US President Barack Obama walks past a main engine of a shuttle as he arrives to speak on the new course the administration is charting for NASA and the future of US leadership in human space flight at the Kennedy Space Center in Cape Canaveral, Florida, on April 15, 2010. When NASA's space shuttle fleet retires in 2011, the space agency will have to rely on Russian spacecraft and the private sector to taxi cargo and humans to and from the International Space Station, even as it turns its focus to the technologies required to send humans beyond low-Earth orbit. President Barack Obama views the policy as a boost to the nascent commercial spaceflight industry, where competition is already heating up to supply the taxi services. 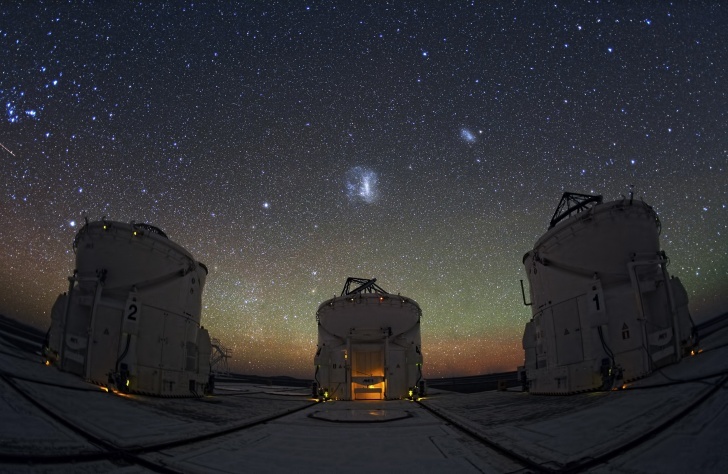 Some companies are also talking about offering out-of-this-world rides for researchers as well as tourists with deep pockets and a serious case of star lust. Click ahead to check out 10 of the top players in the race to commercialize space. SpaceX's Falcon 9 rises from its launch pad at Cape Canaveral Air Force Station in Florida on Friday, sending a test capsule into orbit. PayPal co-founder Elon Musk has already signed up NASA as a marquee account for his high-flying venture, Space Exploration Technologies, also known as SpaceX. The government has a $1.6 billion contract with the Hawthorne, Calif., company to provide unmanned cargo deliveries to the International Space Station starting in 2011 with its Falcon 9 rocket and Dragon capsule. This image shows the successful test launch of the Falcon 9 rocket on June 4. The rocket will eventually carry the Dragon to orbit. 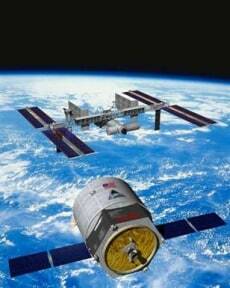 If all goes according to plan, astronauts may get a lift as well, starting in 2013. SpaceX has also secured contracts to launch next-generation satellites for the telecommunications company Iridium. Another NASA contract — this one worth a reported $1.9 billion — is in the bag at Virginia-based Orbital Sciences, which is planning to supply the International Space Station with its unmanned Cygnus spacecraft, shown here in an artist’s rendering. A newly-developed Taurus 2 rocket will ferry the cargo ship to space. If the opportunity presents itself, the company may advance plans to ferry humans to orbit as well. Boeing is hard at work on the research and development of a new space capsule aimed at flying people to the International Space Station. 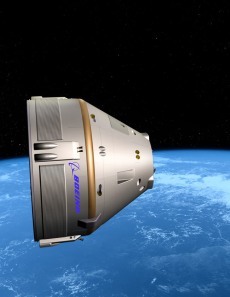 Boeing, the aerospace giant, has unveiled plans to flesh out designs and build a new capsule-based spaceship called the CST-100, which will take cargo and passengers to the International Space Station. The development push comes thanks to an $18 million NASA grant. The Apollo-like capsule will carry a crew of seven and be designed to launch on a variety of rockets, including the Atlas and Delta rockets operated by the Boeing-Lockheed Martin joint venture known as the United Launch Alliance, as well as SpaceX's Falcon. Extra seats may be made available for paying passengers through a marketing arrangement with Space Adventures. 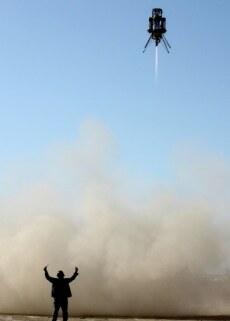 This photo shows the Masten Space System rocket XA-0.1B, also called "Xombie" launching from the pad, traveling 50 meters above the ground at the Mojave Air & Space Port. Mojave, CA on Oct. 7, 2009. While big NASA contracts have already gone to big names in the commercial space industry, lesser-known Masten Space Systems is in the race to pick up taxi fares to the International Space Station as well. The company won a $1 million lunar challenge prize with the Xoie spacecraft shown here. It is now working on a next-generation vehicle based on the vertical-takeoff-and-landing design to ferry cargo. 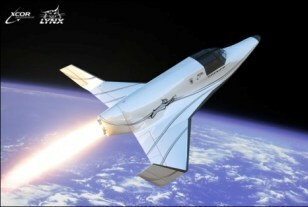 NASA funding will go toward four test flights of the spacecraft, called Xaero. The reusable Dream Chaser space plane, under development by Sierra Nevada Corp. subsidiary SpaceDev , has a look and feel reminiscent of a mini-space shuttle. Like NASA spacecraft, a rocket lifts the space plane up — and at the end of its mission, the plane lands on a runway. In fact, the transportation system is based on NASA technology, and the company recently received $20 million from the space agency to continue the plane's development. 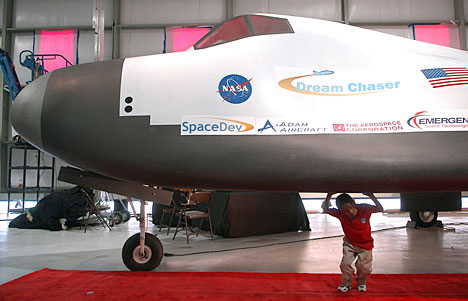 A full-scale mockup of the plane is shown in this file photo from its unveiling in 2006. Entrepreneur Robert Bigelow padded his bank account by building a hotel chain, Budget Suites of America. His latest pioneering venture, Bigelow Aerospace, is aimed at building affordable habitats in space. 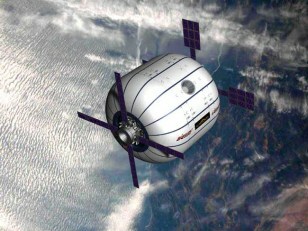 Two prototype inflatable capsules have already been launched, and plans are in the works to put the more expansive Sundancer space station, shown here in an artist's conception, in orbit by 2015. In this case, the overnight guests may include national space agencies as well as private-sector researchers and thrill-seeking tourists. Other players in the commercial space sector would taxi guests to and from the puffy digs. Amazon.com founder Jeff Bezos, who amassed a fortune selling the printed word online, has few words to share about Blue Origin, his commercial space venture to fly a vertical launch and landing rocket to suborbital space. This much is known: A demonstration vehicle called Goddard, shown here in a file photo, successfully took off and landed in 2006 from the company's private spaceport in west Texas. It's not yet known when the company's commercial vehicle will be ready for a public unveiling. A bit more info: NASA recently awarded the company $3.7 million of a $50 million pie that it says is for the "development of system concepts, key technologies, and capabilities that could ultimately be used in commercial crew human space transportation systems." Blue Origin is concentrating on the development of a launch escape system that could push a NASA capsule to safety in case of emergency. 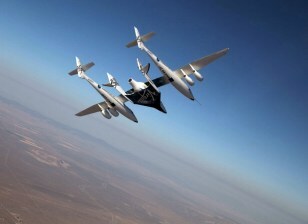 The Virgin Galactic suborbital spaceliner SpaceShipTwo makes its first crewed flight on July 15, 2010 over the Mojave Desert in California. Space enthusiasts with $200,000 to burn can book a ticket to ride to outer space with Virgin Galactic on the SpaceShipTwo spacecraft. 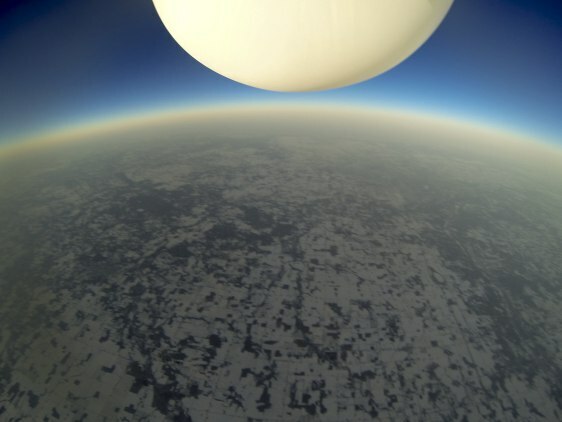 The plane, meant for tourism as well as research, will haul six passengers and two pilots on suborbital flights that pop into outer space for a few minutes before returning to Earth. The aircraft was designed by aerospace engineer Burt Rutan and colleagues at Scaled Composites. Test flights of the spacecraft, which launches from the WhiteKnightTwo mothership, are under way. Ticketholders will get their opportunity to ride once all systems are a go. Would-be space tourists who balk at the price tag for a ride on Virgin Galactic's SpaceShipTwo might consider another option in the offing: $102,000 for a seat on Texas-based Armadillo Aerospace's vertical takeoff and landing vehicle. The spacecraft, shown in this artist's conception, will rocket passengers into outer space for about five minutes of weightlessness and 360-degree views. Tickets can be booked through Space Adventures, the same company that has arranged rides to the International Space Station for the super-wealthy. Yet another option for the space tourist is a $95,000 trip up to the inky blackness at the edge of space in XCOR's Lynx rocketship. The spacecraft, which has room for just one pilot and one passenger riding shotgun, takes off horizontally from a runway and climbs steeply to 200,000 feet, where views abound of planet Earth and the stars. Advance reservations for the hour-long trip can be booked through space tourism company RocketShipTours. An artist's rendering of the rocketship is seen here.